Rockland produces a wide array of ready-made conjugates, but also provides customizable, on-demand conjugation services for specific research needs. We produce antibody conjugates for both primary and secondary antibodies, while monoclonal and polyclonal antibodies are conjugated to Peroxidase (HRP), BIOTIN, alkaline phosphatase, and fluorescent dyes such as Atto Dye, Fluorescein, IRDye™ and DyLight Dye. Common applications include ELISA, western blotting, FLOW cytometry, immunohistochemistry and immunofluorescent microscopy. Rockland offers antibody and protein conjugation services associated with a wide range of common reporter molecules used in molecular immunology. Reporter molecules, also called antibody labels or antibody tags, typically include enzymes such as horseradish peroxidase (HRP), alkaline phosphatase (ALP), glucose oxidase (GO) and beta galactosidase (BGAL or ß-gal); or fluorochromes including Fluorescein, DyLight dyes, IRDye™ dyes, phycoerythrins, Rhodamine, Texas Red and others along with biotin, digoxigenin and assorted haptens. Horseradish Peroxidase (HRP) Conjugated Secondary Antibodies are the most popular antibody conjugates and can be used in Western Blot Analysis (immunoblotting), ELISA and Immunohistochemistry. In addition to the HRP-conjugated secondary antibodies, Rockland produces secondary antibodies that are Fluorescein conjugated, as well as conjugates to Rhodamine, Texas Red, Phycoerythrin (PE) and dyes for multiplex platforms like the LI COR Odyssey Imaging System or Molecular Devices multi-mode readers. These dyes consist of Atto Dye, DyLight™ Dye, IRDye® 700 and IRDye® 800. Reporter enzymes are used extensively in molecular biology to detect immune complexes. Horseradish Peroxidase (HRP) is a widely used reporter enzyme, and depending on the substrate, can yield a colorimetric, chromogenic or luminescent product. Alkaline phosphatase is also used, most typically as the reporter in chromogenic western blot assay format. Rockland provides extremely sensitive chemiluminescent HRP substrates which are nonradioactive and provide enhanced luminol-based chemiluminescent for the detection of horseradish peroxidase (HRP) in western blotting and enzyme immunoassay (EIA) use. Rockland also manufactures substrates with 3, 3', 5, 5' – Tetramethylbenzidine (TMB) to aid in the detection of custom antibody conjugates. Fluorescent antibodies can be used to analyze the distribution of proteins, glycoproteins and other antigen targets including small biological and non-biological molecules. This provides considerable insight into the movement and utilization of antibodies throughout various biological systems. 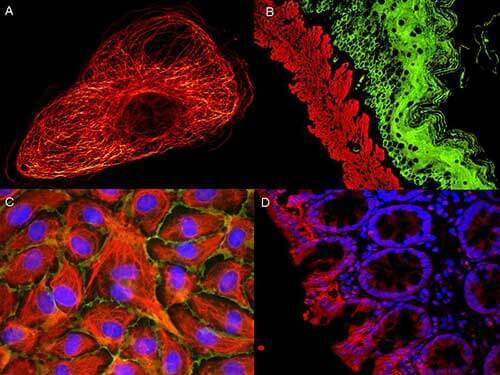 Primary, or direct, immunofluorescence uses a single antibody conjugated directly to a fluorescent dye. Secondary, or indirect, immunofluorescence uses two antibodies; a primary antibody which recognizes the target biomolecule and binds to it and a secondary antibody conjugated to a fluorescent dye, which recognizes and binds to the primary antibody and indirectly localizes the target for detection. Rockland conjugates a broad group of secondary antibodies to many of the classic fluorescent markers including fluorescein, Texas Red, and Phycoerythrin. All of the conjugates are ideal for various immunofluorescence based assays including fluorescent western blotting, immunofluorescence microscopy, FLISA, and more. Rockland also produces many next generation fluorochrome dyes designed for detection of primary antibodies in multiplex, multi-color analysis. Next generation fluorochrome conjugates (Atto-tec dyes, DyLight™ dyes) offer superior absorption (high extinction coefficient), high fluorescence quantum yield, and superior high photostability. Excitation and Emission spectra of selected ATTO-TEC dyes available for the labeling of custom antibodies.